Halloween happens to be my favorite holiday so when Diana of Suburban Girls Studio announced she was doing a hop all about Halloween how could I possibly resist. And what is fits the season better then spooky spiders? Well besides pumpkins and witches. Don't you just love the spooky spider focal that was made by Jenny Davies-Reazor? And it all comes together with both botswanna and black agates. 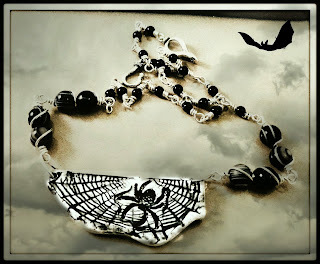 And yes I had fun with the special effects but the necklace did start out black and white. Now that you have seen my contribution, be sure to check out what everyone else has come up with. I love that focal! You better wear that on Thursday...it's perfect! Thanks for participating! What a wonderful necklace, love Jenny's focal piece!!! Happy Halloween! LOVE the necklace - AND how you photographed it! Spooky! Your necklace is fabulous! I also used one of Jenny's focals for my blog hop design...don't you just love her work. Nice work...Cheers! Love :) And I hate spiders, but that is a fabulous focal! That is a gorgeous focal and you set it off magnificently! Very cool focal! Wow! And I love how you pulled everything together. I love Jenny's focal! And your choice of stones and lovely wire wrapping are perfect accent! Even though I don't care for spiders (sca-ry), you have a great Spider necklace. Jenny's focal is just amazing and I love the necklace you made with it. Very spooky cool! Great choice of focal for all of us spider-lovers! Nice work on the necklace. Happy Hallowe'en!! That pendant is the coolest thing! I love the way you used it as well, great necklace! Gorgeous, Shaiha! Your wire wrapping is phenomenal. Really cool! Love that focal.